Contrary to popular belief, I haven't given up on PractiGanic! This summer has just been too much fun with the kids, my Etsy Store has been taking off, I've accomplished another triathlon and working on strengthening my yoga practice that they computer has taken a back seat (can you blame me?!). Hopefully now with two in school and only two at home ... Francesca is already 6 months and the coolest baby ... I should be able to start tackling my laundry list of blog posts that I have been backlogging. So, without further ado, my new dip love ... Roasted Red Pepper Baba Ganoush! I will be the first one to tell you that I don't like eggplant. Okay, so maybe not entirely true ... you know how I always tell you that "it's impossible to dislike a vegetable, you just haven't had it prepared the way you like it yet?" Well, the way I like eggplant is breaded, deep-fried and smothered in cheese. Let's just say, I usually only eat eggplant once a year! However, I still buy it at least 4 times a year making different things and telling myself, "This is it ... Get ready to love eggplant!" Time after time, the eggplant gets choked down and I am sad about dinner and vow not to buy eggplant again. Old habits die hard. I was at the farmers market and there is the most beautiful stand off eggplant, miniature eggplant, Japanese eggplant, striped, white, purple ... they had it all! I couldn't help myself and I had to buy one. 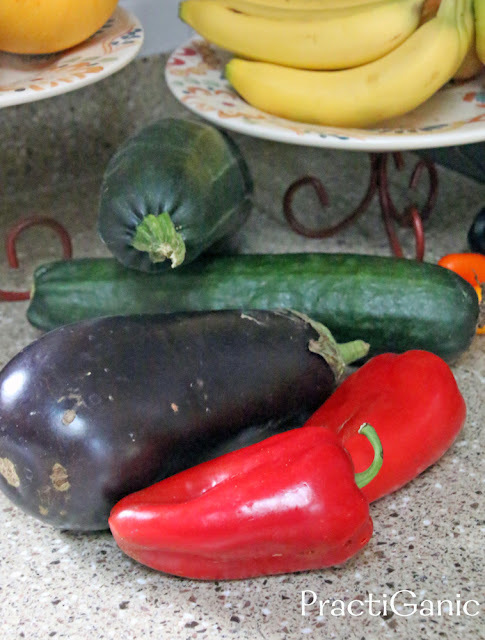 When I got home, I stared at my lone purple eggplant thinking, "Now what am I going to do?!" 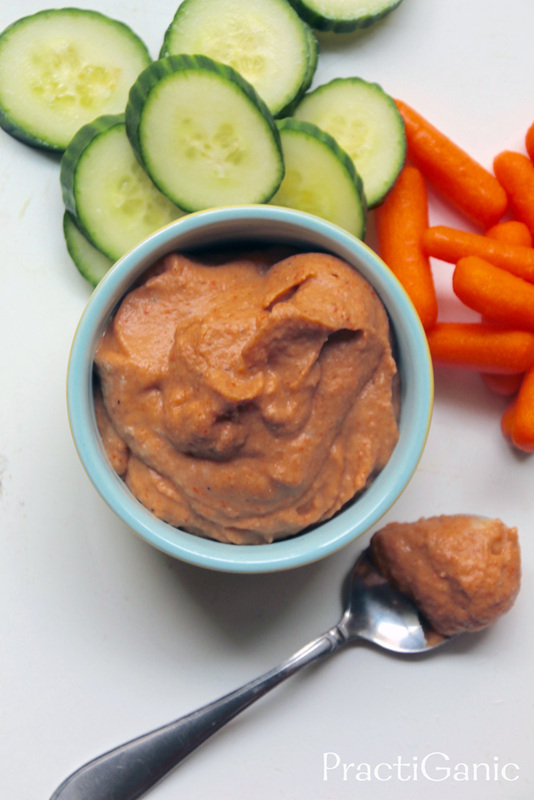 In my experience, I have learned that if I have to hide a vegetable in a meal, put it in a dip or a burger. I had a party in two days so I decided to go for the dip. A simple baba ganoush but I had to give it a twist in order for this to hopefully be a winner. I decided to try a roasted red pepper baba ganoush (seriously, isn't it the best word to say??). I added my favorite seasonings in the whole world ... paprika and coriander, crossed my fingers and pureed that eggplant and you know what? IT WORKED! With every visit to the farmers market, I am now buying eggplant! 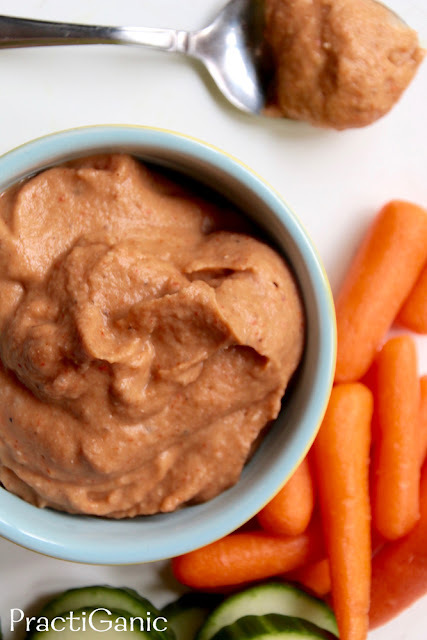 The whole family is digging in too (even Francesca is loving her newest 'baby food') It's lighter than hummus, but just as flavorful ... and, no oil needed! I finally found the way that I can enjoy eggplant and still be healthy! 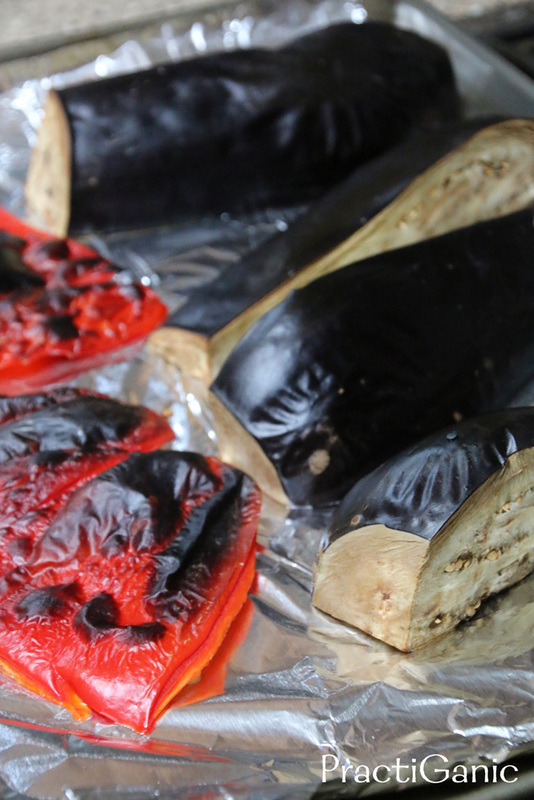 Cut eggplant into quarters and deseed the red pepper. Lay them down on a sheet tray with their skins up. 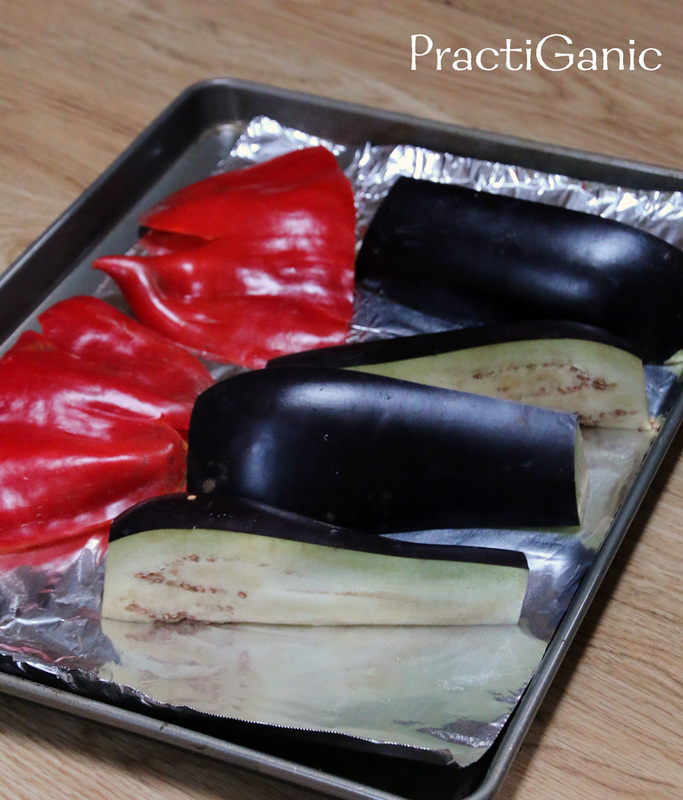 Broil for about 5 minutes or until skins on pepper are blackened and the eggplant is shriveled. 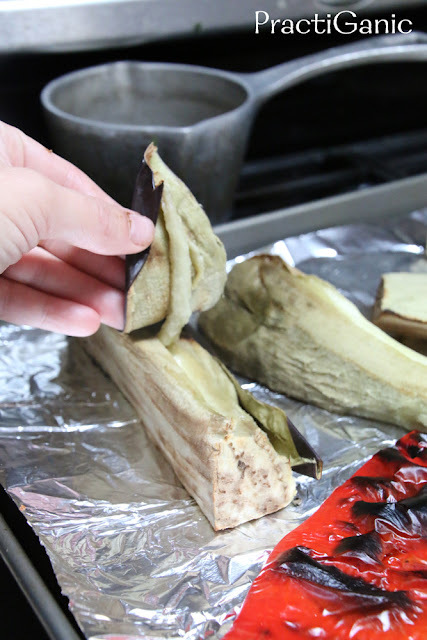 Let them cool and the skins will peel right off. Add all ingredients into your blender and puree until smooth. Enjoy!